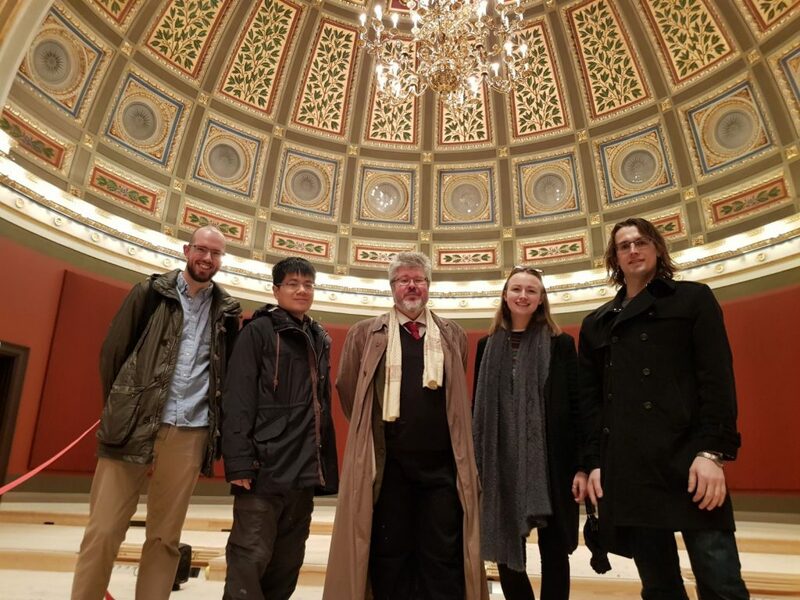 Our Durham delegation representing St John’s, Ustinov and Trevelyan colleges recently visited Uppsala University in Sweden (April 2018). We went to explore the curious concept of the Uppsala Nations: centuries’ old student-led institutions, historically representing different regions in Sweden, but otherwise not too dissimilar from Durham’s Colleges….or are they? Here are our reflections. What is an Uppsala University Nation anyway? Think of them as colleges, but with all the staff replaced by students. Seriously, every single one from the top administrators to cleaning and kitchen staff. Yes, there is the equivalent of a College Principal called the “Inspector”, but even that’s a voluntary and mainly ceremonial role without a big pay packet. We have been amazed by how much of what we’d normally imagine as roles for the University that these Nations take on. It is said that these are communities in which you can safely fail. Most Uppsala students arrive with no management or leadership experience, but through being dropped in at the deep end, they learn by doing (and occasionally failing). Through this process, students gain invaluable life skills and work experience. This is such an important part of a holistic education that we are quite envious of. For example, students taking on a leadership role in a Nation (not just the President, but many other roles) get paid time-off from their studies to do that job full time. Many students alternate between their studies and running a Nation throughout their time at Uppsala University. We also learned about their extensive and tight-knit alumni network, where people who graduated decades ago would still come back and support their Nations. This demonstrates the huge impact from being in a community genuinely shaped by its student members on their lives. Uppsala University has a history just as rich as Durham’s, and we learned much of it through an amazing guide that we met one morning. Mikael is Uppsala’s official University guide who taught us lots of cool trivia along the way. This includes the fact that famous scientists like Linnaeus and Celsius worked here (and were, in fact, third cousins), or that in just one of the thirteen Nations boasts three Nobel Peace Prize winners including a United Nations Secretary General! We are particularly curious to learn about the representation of students on the University senior management team. It turns out that about 50 years ago, there was a student “revolution” where they occupied a university board meeting to demand better student representation in management. This led to series of reforms where now, three out of the nine members of the equivalent of the University Executive Committee are students! 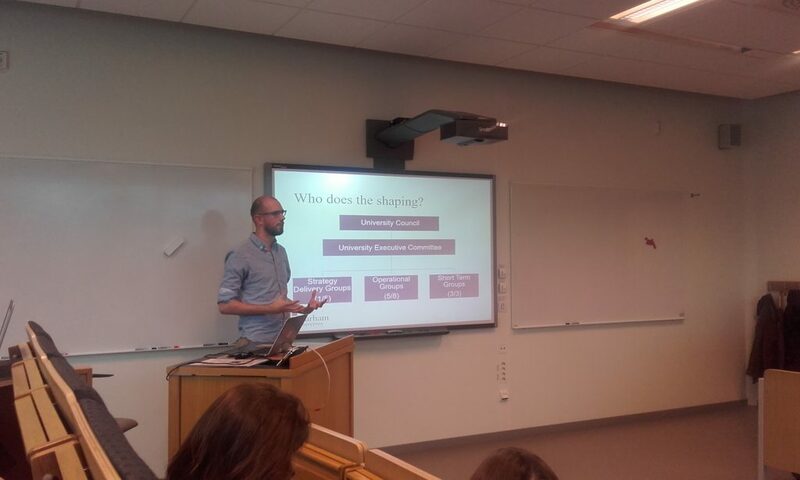 Another thing was that there’s unparalleled flexibility in how a student at Uppsala can shape their academic journey. Some have switched degree programmes multiple times as they explored their interests and learn from their experiences. For many, this is aided by their time running a Nation because it is a safe place to try and fail and learn! The nations are linked by the Kuratorskonventet (KK for short), through which the nations’ curators (c.f. College presidents) collaborate. This is not dissimilar from the common room presidents committees that exist within Durham, except that the discussions don’t concern themselves with much of the academic side of life. That role is left up to the student unions (yes, plural – there are six of them at Uppsala! ), which provide representation for students in a purely academic capacity. In Durham, the roles these three bodies (Nations, KK, and the student unions) play are covered by colleges, common rooms, and Durham Students’ Union. Most interestingly are the things that each side leave to the University to manage. In Durham, accommodation is the domain of the University, whereas in Uppsala the student-run nations own and manage their own accommodation and estates. Conversely, Uppsala’s administration has sole responsibility for the welfare of its students, but in Durham this is seen as a joint venture between all of the parties, student organisations and staff alike. Oddly, given the strong sense of competition and friendly rivalry between nations (notably one nation threatening to knock another down! ), there is no organised sporting competition between them. Certainly inter-collegiate sports leagues add a lot of flavour to life at Durham, but it seems this gap is filled by playing for local teams in the Uppsala area unrelated to the University. My most peculiar discovery has been Uppsala’s “Light Room” for those suffering the long hours of winter dark at high latitudes (https://www.uu.se/en/students/support-and-services/health-care/light-room/). I know some of the international students in my college would certainly appreciate this during the dark days of winter in Durham! To say that one can think of Nations as the same thing as Colleges misses some of the fundamentals of both, but in many cases, where it matters, they serve the same purpose – providing a truly unique student experience. As has been mentioned, where our Colleges have full time staff employed by the University, Nations have multiple sabbatical roles, mostly filled by students taking a year out before finishing their degrees. Where our Colleges have kitchen and housekeeping staff, keeping food on our plates and our accommodation in order, Nations have volunteering rotas, rewarded in the most part by points and meals rather than minimum wage. And where some Nations do have employed staff (Uplands Nation, the largest of the Nations, has just taken on a professional head Chef to ensure 400 formal meals can all go out hot at the same time! ), they are employed directly by the Nation, not the University. This autonomy and truly student lead system provides incredible experience and leadership opportunities that really add to both their time at University, and their employment prospects – indeed we heard the story of a business run by one Uppsala alum that will automatically give a job to any Nations Curator (College President), if they apply, so valuable, and valued, is that experience! There are certainly aspects of the University experience in Durham that are lost at Uppsala due to this – the lack of sports being particularly striking, and something that the Nations and University are working on (something that I think Durham could really help with! ), but also the absence of any peer to peer welfare systems or support networks was a real surprise, and lack of postgraduate involvement in the Nations a disappointment. However, there is one aspect of student life that both of our systems have done very well – the social side! In our 3 day visit we experienced the full range that Uppsala has to offer, with a pub meal at V-Dala Nation, a private dining meal at Stockholms Nation followed by, apparently, the trendiest club night in Uppsala (what else did we expect from the Nation of the Capital? 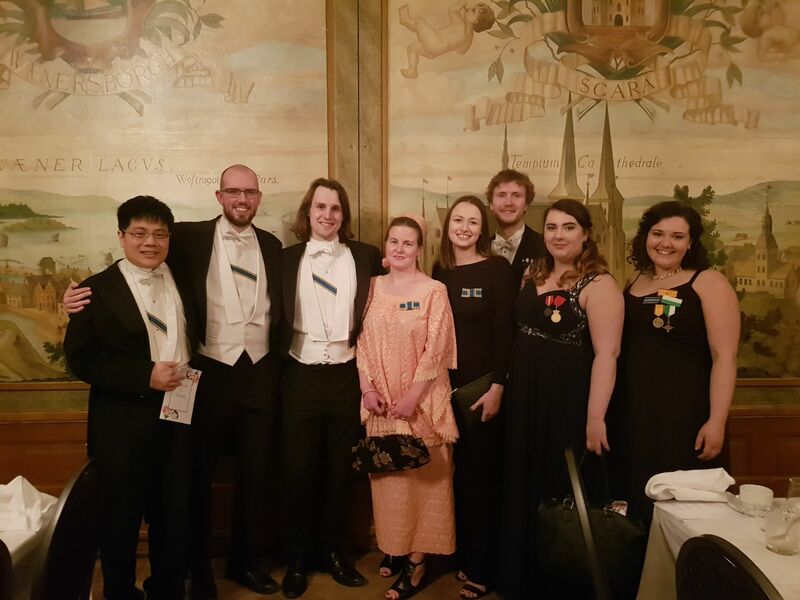 ), and finally a full white tie formal at Västgöta Nation complete with singing, schnapps, and being awarded one of Uppsala’s highest honors – Honorary membership of the kuratorskonventet (we got a sash!). This social life, distributed throughout nations, with all levels of formality catered for, is one of the common threads that tie Durham and Uppsala together, and provides us with a platform from which we have built a great friendship between our institutions. From here I am confident that we can make great progress, with Durham learning from the trust and responsibility put upon Uppsala students, and Uppsala taking much from our sporting, welfare, and postgraduate programmes. I travelled to Uppsala intrigued and left feeling both fascinated and frustrated. I joined the group relatively late, being asked to visit Uppsala in March. This meant that I had very little knowledge of the University before my visit – I merely had a rumour that their Nations (effectively Colleges) were entirely student lead but no clear idea of how this was possible. After chatting to the Nation Presidents, Bar Officers and other students, it turns out that running a College by students for students, is actually pretty simple. When students are trusted and respected, they can do great things. Now it has to be noted that the Nations are, in some senses, simplified Colleges. They have no accommodation onsite which removes the need for students to clean or maintain student rooms. Further, only some Colleges offer food (I don’t think any College was fully catered). However, any food which was cooked and served to students was cooked by their peers. Additionally, law in Sweden specifies that any bar which serves alcohol must also serve food and therefore each student bar served burgers, pizza and snacks throughout each night. The occasional formal dinner or white tie ball was also catered by a student team. In Uppsala, student responsibility extends further than running a College. Within Uppsala, student representatives sit on the highest University committees – Uppsala’s ‘UEC’ equivalent sees the student need being directly vocalised to staff. Here in Durham, only the SU President is present in these meetings, that’s one person representing 17,000 students (soon to be over 20,000). It was this aspect which left me feeling both fascinated and frustrated. As a President of a Common Room, I am mandated to represent the student need and work to ensure that all decisions made are in the best interest of those I represent. Yet often the decisions I seek to influence are decided at meetings that no Common Room President is invited to attend. The question I ask is, why is this the case? I appreciate there are numerous logistical reasons as to why 16 Presidents aren’t invited to every University meeting yet it is debatable as to whether these reasons outweigh the benefits of having of having the student voice heard at the highest level. Student representation at this high level has proven to work, as shown in Uppsala. This isn’t to equate the two Universities, clearly there are differences, however we are not so different that a Presidential presence at various meetings wouldn’t work. A proposal which, in an ideal work, the University Executive would take under consideration. Any business works best through collaboration, collaboration between a diverse range of people offering different perspectives. While the University is a business, it is one that should be focused on the wellbeing of the students. Students who are best represented by the Presidents they elect. And yes, I am biased as a President myself but I don’t see any reason as to why student representatives shouldn’t be consulted on those issues which affect the students. This isn’t to say that the student voice in Durham University isn’t represented at any meeting, nor is it to undermine the work which has already been done to engage with Common Room Presidents, and the wider Presidents’ Committee. Having representation on SDC, SFAAG, and similar is fully appreciated by students and their representations. I simply think that we could go further – engage with students more and at higher levels, to ensure that the best interests of the students are at the forefront of every decision possible. As I said, when students are trusted with power and responsibility, great things can happen as highlighted by the structures in place in Uppsala University. They are a leading example, one which I hope that Durham can follow. · What are the roles and functions of a student union when a University has colleges/nations? · What is/should be the role of students in shaping a University? · Can students be consumers and co-creators of the University experience? · What is the role of the University as a global citizen? The audience – Uppsala student leaders and representatives, exchange students from Durham, and various staff members – had lots of questions about University life at Durham, and the half hour allocated for discussion was nowhere near enough, there was so much to say, and a feeling in the room that the wider questions of students’ role in today’s University are not talked about often enough. The Uppsala Nations offer a fascinating and for us rather challenging model of student ownership for student life at the university. There is a lot we can learn from each other as partners. If I had to choose, I would still make a case for Durham and our collegiate model – and that’s not just because I would be out of a job in the Uppsala model… No, there is something unique about the way students and staff can work together as partners in a Durham College: staff offering continuity and experience, and students new ideas, energy and often much needed skills, and learning from one another in the process – this exchange being a perfect example of that.